Where am I going in life, will I be successful, will I travel and will I be healthy ? Questions that a palmist gets asked every working day, and of course being a palmist, he can tell you! made man. Much like the heart line, with the fate line, you can also work out approximate timings of events. The line itself governs work and career, and through experience, I have found that if the line is long and crosses both Head and Heart line, they will be a person who will work for most of their lives, and usually won’t stop, even for retirement…they’ll ask to stay on, or get another job! It really indicates a person who has to be active, whether it’s working for a living, voluntary work, or making the most of retirement and having plenty to do. I’ve got a long Fate line..drat it ! I had visions of lazing about on some Floridian beach as the years progressed…mind you thinking about it, I’ll probably be working on the beach giving Palm readings…having a permanent holiday and being paid for it. Now there’s a thought ! Enough of this daydreaming, lets get to it. If the line is erratic at times i.e. zigs and zags,( fig.17) this is usually a good indication that the person will embark on some study course for a year or so. Therefore it will come as no surprise to you that students at College & University often have the zig zag pattern near the start of the line. ( towards the base of the hand ). If at some point the line veers off, this is a strong indication of a change of career. Notice I have said career and not job. This is because you can move to another company doing a similar job and no mark is shown on the hand for this. Career is defined as doing something completely different from what has been done before…you can be a plumber one minute and managing a plumbing firm the next…now this is different, you’re no longer doing the plumbing, you’re now managing. See what I’m trying to say here ? If the line is deep and long, this is indication that a person will have natural talent and will do well in his or her chosen profession. Whereas deep and short, indicates such talents will not bear the fruit that may be hoped for. The line being thin shows that in order to succeed, that person may have to labour Should the line carry breaks, then indication is towards, periods where the subject may take a rest from work, and/or change job often. Now this is one line that is certainly not on the majority of hands. It is usually found on the famous or people who have the ability to be famed in whatever sphere of life their talents lay. Should it be a long line, this shows the person to have great talents, and at the same time make the most of them. The ultimate line though, goes well up through the Heart and Head line and shows whatever world the person moves in, they will be brilliant and acquire reputation. Should it be short, the indication is that the subject possess talents but they will not be productive of great results ( you can say that again ). While we’re on the subject of success, there is another small line that points to Notoriety. This is always to be found on the Left Hand. Look for a single line with no breaks that goes up from the heart line and joins the base of the 3rd finger. In finding such a line, here is a person who will gain some notoriety in a particular sphere of life. They may not gain any financial wealth from it, but they will be certainly well known in their field. 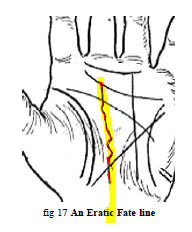 This line usually runs diagonally across the palm, starting (but not always), from around the base of the thumb, finishing just underneath the beginning of the Heart line. If it does actually start on the life line, then that person could encounter heart problems (but not heart disease) at some stage in life. Most lines however, start at some distance from the life line. Many hands do not have a Health line at all, and in doing so they are rather fortunate….life indeed will be worth the living with nothing much to go wrong with them, apart from everyday chills etc……barring accidents of course, for which there is no line on a hand to foretell such happenings. being British and not being mardy…honest ). A weaker or short line, suggests illness may take a little longer to recover from.